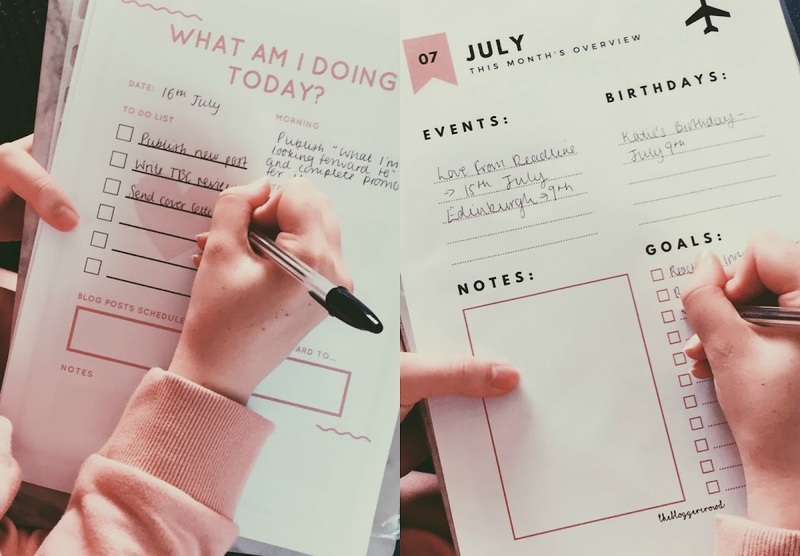 The three main concepts within this sample were the the 'blog post planner', the daily planner and the monthly overviews. The blog post planner is a really great idea and something that I reckon would be useful to a lot of bloggers. With this page, you'd require one per post as they are focussed on the one post - I like this because it means that you wouldn't get muddled as to where you put 'that post' or 'this post'; there's a box at the top making it pretty clear which post is being discussed. The general look of this page is adorable. I'm a huge fan of white backgrounds with simple, modern graphics and this definitely does that. The dots are cute, the colour pallet is cute and the font is cute. My only iff with the layout is that the section about 'websites to link back to' doesn't, for me, need to be so big. It's understandable that some bloggers use the marketing strategy of repeatedly linking their content throughout posts but, for me, I find that my links are continuously uniform across my posts and, aside from the odd link here and there, they're always the same links at the same place; so not something that I feel would even need to be mentioned when planning posts. I feel that, from this page, I'd like to see the 'notes' section a bit bigger or, alternatively, a section for structuring the post e.g. Intro > Body > Conclusion > Call to action. This would be an ideal feature for me and would be, I'm sure, to many other bloggers. 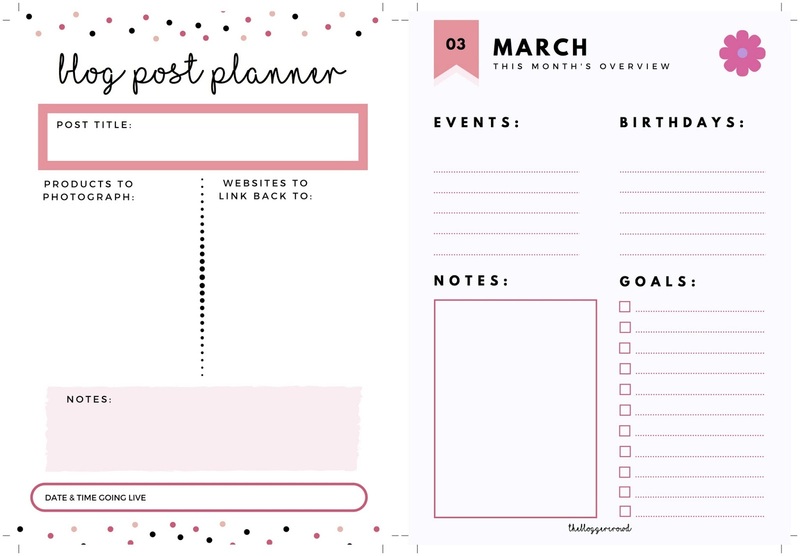 Overall, the post planner is aesthetically pleasing and showcases the best crucial info such as date/time, post title, and what needs to be done with photography in order to completely prepare for the post. I chose to print and complete the July monthly overview which I found generally faultless. Again, the aesthetic was pleasing and I particularly liked how each month had a different icon in the corner according to the season; e.g. March had a flower, July had a plane, and October had a pumpkin. The only missing thing is a list for blog posts going up in that month. I guess that blog posts could be added into the 'Notes' section but I think it could go that little bit extra specific. Overall, with the monthly overviews, I really value the 'Goals' because I am the kind of person to set goals for the month then forget about them and thus not complete them. Due to the fact that I can write them down here, I'm less likely to forget about them and more likely to stay focussed. The daily planner has to be one of my favourite pages because it is jam-packed with so many useful features. I'm a sucker for a good, ol' To-Do List, so I got straight on with writing that down. The lines could be a little longer and perhaps the tick-boxes a little bit smaller, but I'm satisfied with that feature. I love the positive vibes that this page radiated effortlessly at the bottom of the page with the 'looking forward to' section - I guess it is a little bit mindfulness-ish in the way that it controls you to focus on the positive aspects of the day. Along the side of this page, there is a pale pink box for each 'Morning', 'Afternoon' and 'Evening' which I found useful for sectioning up my day as well as helping to realise whereabouts in the day I was best fitting things in to avoid doing lots of things all once. This page is my favourite of them all in terms of layout - I love the question at the top, the wavy lines, the fact that there's a lot do to and the fresh colour palette. 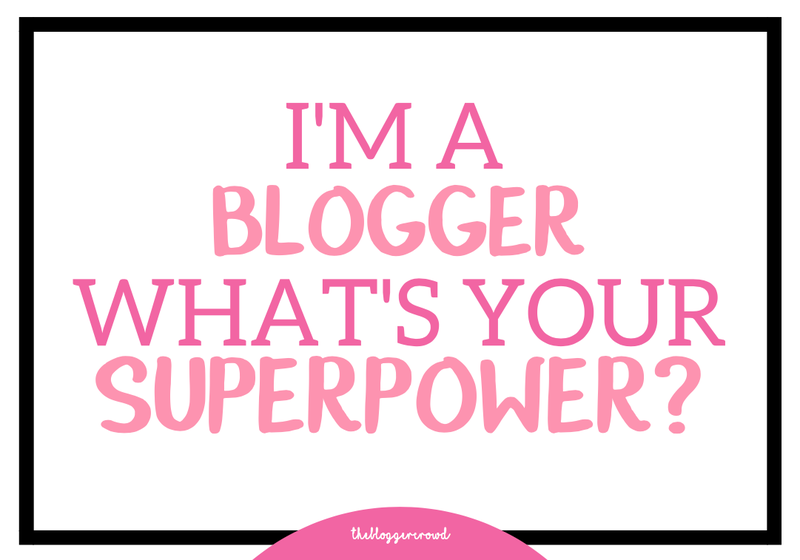 As a whole, the blogger pack is really useful to me and I can't wait for The Blogger Crowd to reveal the full pack. 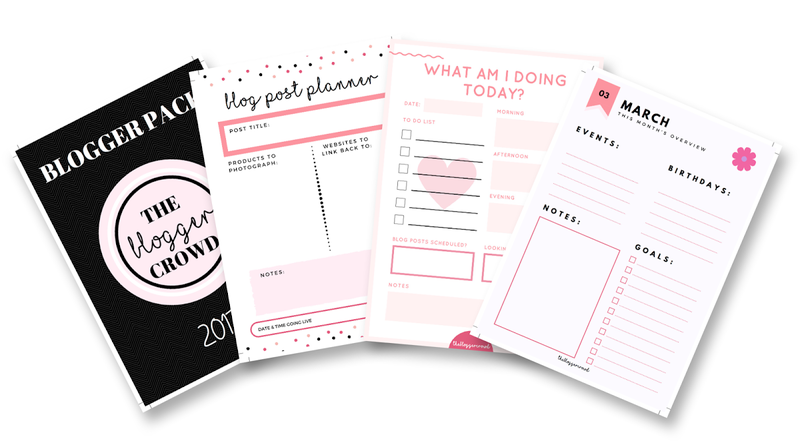 The official pack is set to include even more great tools for aiding your blogging process as well as some really exciting blogging related prints. I really recommend that you follow The Blogger Crowd on their Instagram and Twitter because, as soon as the website is launched, Blogger Packs like this one are going to be available for download from as little at £1.50. *This blogger pack was sent to me for reviewing purposes but all opinions are 100% my own. You should definitely keep an eye out and get your hands on this when released! !